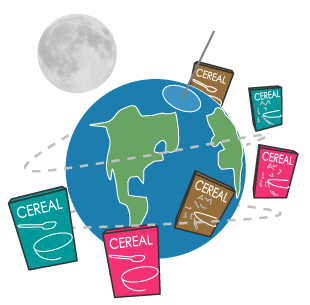 Americans eat enough cereal each year to create a chain of empty boxes all the way to the moon and back! Kid’s cereal, adult cereal, health cereal, warm cereal, cold cereal, cereal with marshmallows – there is cereal for everyone. What makes us choose? An ad on TV? The box in the store? When you eat cereal, what do you do with the box? Read it or put it away? Are there games? More ads? Facts? Or a description of the prize inside? What you see is carefully planned by a team of graphic designers who create the boxes. Their goal is to get you to eat their cereal! And they tell the stores where to place the boxes on the shelves depending on their target audience. What better use could empty cereal boxes serve? A lot of us read our cereal boxes. Consider your cereal box design. Can you do or learn something on the box? What will the back have on it? A contest? An activity? A game? Coupons? Could boxes be saved and used as toys? Can you cut pieces out of the box and turn it into something else? 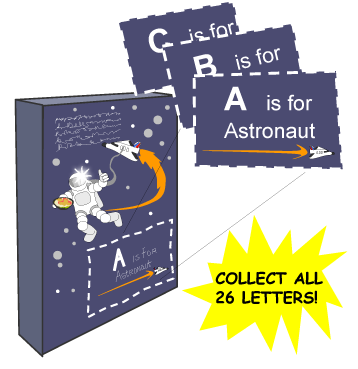 Imagine a new version of a cereal box that is entertaining and educational at the same time. Mock up three possible ideas covering empty cereal boxes with colored construction papers. Use markers or digitally printed words to advertise the name, type and information about the cereal. Evaluate your designs. Ask other people which one they think is the best design and why. Is it bold, easy to read, graphically strong, fun, something they haven’t ever seen before? Can it be collected like number 1-10 or like the letters of the alphabet or pieces of a map of the United States? After taking into consideration at least three people’s opinion, choose the one design that is best, adapt your design to fit your research, and add the back of the box to the front of the box design. .
Design a cereal box that will appeal to kids your age. You are defining a “target market.” A target market is a demographic population that can be studied to reveal certain characteristics and aptitudes. Ask your friends…do they eat cereal? Take a survey of what kinds of cereal they eat and what kinds of cereal they imagine themselves eating. What kind of cereal will it be? First define the type of cereal: hot or cold; consider shape, size, and color and ingredients. Next describe your cereal. What is its texture? What is its taste? Now describe its nutritional value. Next design the cereal box that will hold your cereal. Choose an overall box color. Choose a name. Consider a slogan or a memorable saying about your cereal. Consider creating a character that can be the spokesperson for the cereal. Choose a name. 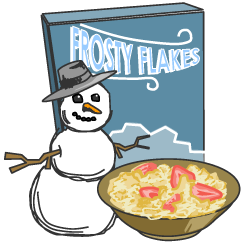 Create the front of the cereal box using text, images, color and pattern. What other information could go on the cereal box to make it more informational? What information is found on every cereal box? What would most likely be found on the front of a cereal box designed for adults to try to eat healthier? What is the distance to the moon and back? Do you read your cereal box while eating breakfast? Should cereal boxes be multi purpose?